The Militant's 25th Anniversary Ultimate (M) Blue Line Tour! Happy 25th Birthday, you Millennial, you! Today marks the 25th Anniversary of Los Angeles' Metro Rail system, which began with the July 14t, 1990 opening of the Metro Blue Line, Los Angeles County's first modern train transit system, and the first rail line to serve the area in nearly 30 years. You may or may be familiar with The Militant's Angeleno's award-winning Epic CicLAvia Tour posts, highlighting various points of interest along the various open streets routes, but did you know The Militant has done the same for the Los Angeles-to-Pasadena Metro Gold Line and the Metro Expo Line? This time around, to celebrate a quarter century of Metro Rail, The Militant offers his Epic 25th Anniversary Metro Blue Line Tour, which points out historic, surprising, and off-the-beaten-path locations on or very near our first light rail route. Even if you've been a regular Blue Line commuter for the past 25 years, if you think you know the Blue Line, guess again! Riders waiting at the outbound platform at the 7th Street/Metro Center station may or may not have noticed a peculiar digital countdown clock situated on a pole in the middle of the tracks. It seems to count down regardless of whether there’s a train or not. What is it for? In 1993, to speed up Blue Line travel times, the street signals along Flower Street and Washington Blvd. were synchronized to give priority to light rail trains along those streets. 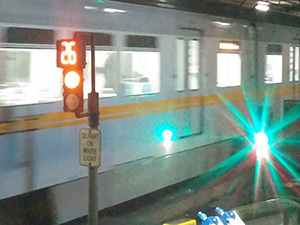 This timer clock allows train operators to time their exact departures in accord with the street signal synchronization, so that when the white light under the clock is lit and the train begins to depart under normal operating speed, the train will encounter a continuous series of green lights. 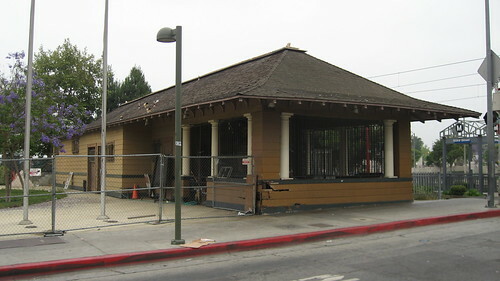 Pico Station is where it all began; it was the first operational station in the history of Metro Rail. The station was the site of a public dedication ceremony kicking off the opening of the line (See The Militant's exclusive archived video of the event here). The Blue Line on opening day in 1990 was somewhat shorter than the line we ride today. For the first two months of operation, the Blue Line only ran from Pico Station to the Anaheim St. Station. Back then, it was just located in a far-flung region of Downtown. It wasn’t until the late 1990s when the Staples Center was built that the South Park section of Downtown started to become revitalized. Today, the recent upgrades of the Blue Line stations have also given the station a minor facelift. The station also has the shortest name of any Metro Rail station in the entire system (Well, okay, it's tied for 1st place along with Soto and Lake). The first surface-level "junction" track that switches trains among the Blue and Expo lines is located here. A few months after the Expo Line opened, the California Public Utilities Commission ordered Metro to replace a section of rail within the switch track that would potentially cause derailments. The other junction track on the Metro Rail system is the one north of the Wilshire/Vermont subway station. Future junction tracks will be built west of the Metro Green Line Aviation Station (serving the Green and Crenshaw lines) and another switch track as part of the Regional Connector under Little Tokyo. 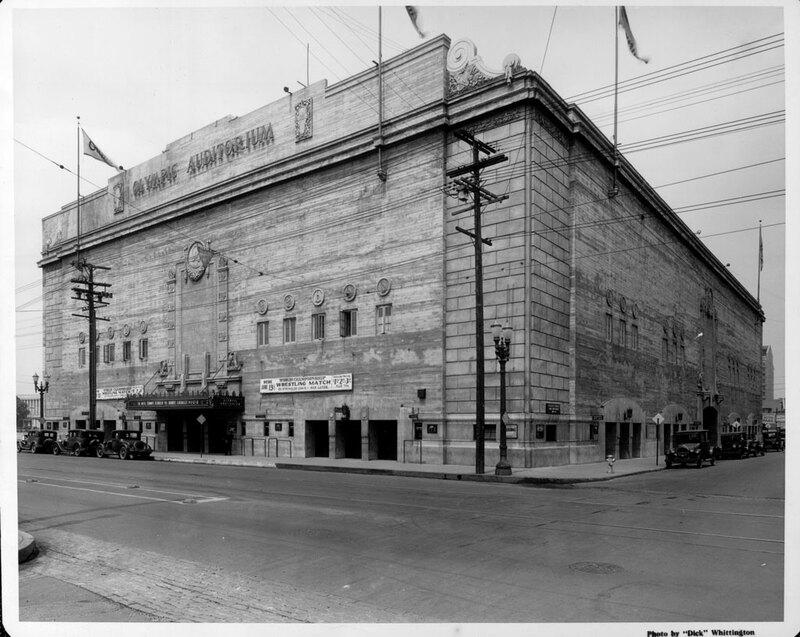 This historic venue through the years, easily seen from the nearby Blue Line Grand station, has hosted boxing matches (including the boxing competitions for the 1932 Olympic Games), wrestling bouts, roller derby events and concerts. The match sequences from the original Rocky movie was filmed here, as well as Bon Jovi's "Livin' On A Prayer" and Janet Jackson's "Control" music videos. For the past decade the venue has been owned by a Korean Christian Church known as Glory Church of Jesus Christ (hence the large Jesus mural on its south wall). On your southbound Blue Line ride, look to the right just before the train curves towards the Washington Station and look for the "Hanson Tank" sign. To the left of the sign, and right above the main doorway is a tiny cubby-hole featuring a Buddha statue. Years ago, a Militant Elder told The Militant Angeleno that the buddhas were placed there to give Japanese Buddhists a clandestine place to worship after December 7, 1941. The Militant covered this location in an early MA blog post in October 2007. Due across the street and due north of the Blue Line's Washington Station, there's a stretch of track that diverges from the Blue Line route that seems to head off into oblivion. The track is one of several along the Blue Line route that function as an emergency storage track for broken trains or so-called "gap" trains to replace trains that have been taken out of service due to technical issues. The tracks follow the original Pacific Electric 4-track "speedway" alignment that led to the Pacific Electric Building at 6th and Main streets in Downtown Los Angeles. In fact if you follow the Washington Tail Track north to 16th Street, you can still see the old Pacific Electric tracks partially buried under the pavement! The Washington Tail Track is rarely used nowadays, though in March the track was used to temporarily store the new Kinkisharyo light rail vehicle which was being tested on the Blue and Expo lines at the time. 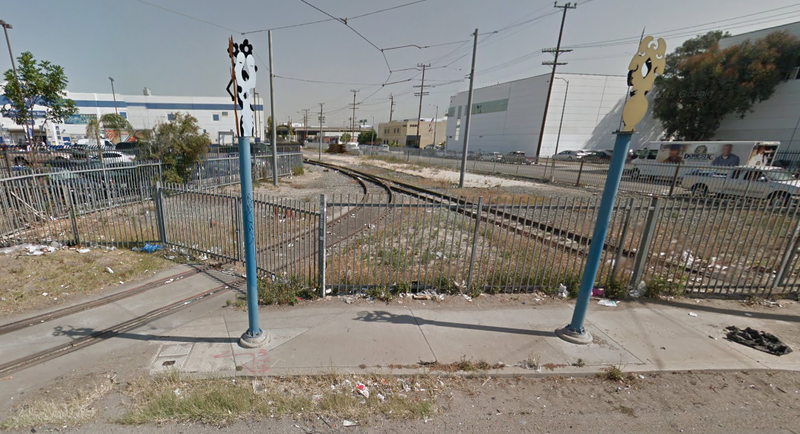 About 6 blocks south of the Washington Station, look to your right and you'll see tracks in the street mysteriously end at the fence that protects the Blue Line tracks. Look westward and you'll see an abandoned rail right-of-way. That was, until 1958, the Pacific Electric Air Line trackage which went all the way to Santa Monica (and until the early 1980s as Southern Pacific freight track), and functions today west of Figueroa Street as the Metro Expo Line. During the Pacific Electric era, the Downtown-bound trains from Santa Monica headed all the way to Amoco Junction (named after the American Olive Company factory nearby) to join the 4-track "Speedway" trunk line and head north. This large, empty plot of land just east of the Blue Line tracks, a half-mile north of the Vernon Station was home to the 14-acre South Central Farm run by community members between 1994 and 2006. Acquired by the City of Los Angeles in 1986 via eminent domain from private landowners, it was originally slated for use as an incinerator site, a plan dropped due to community opposition. The City allowed the neighboring nonprofit Los Angeles Regional Foodbank to run the site as a community garden. Over 300 low-income families from nearby communities turned the land into one of the largest urban farming projects in America over 12 years. But in 2001, the land's former owner sued the City for breach of contract, because the incinerator plant was never built. Eventually the City settled with the landowner in 2003 and they began the process of re-claiming the plot, eventually evicting the farm in 2006. To this day, the land lies vacant. 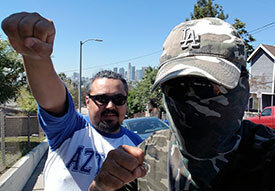 The controversy attracted the support of various celebrities, public officials and philanthropic organizations, including a failed attempt by The Annenberg Foundation to purchase the land, but it did galvanize the community and led to the rise in urban farming activism, especially in the South Los Angeles area. 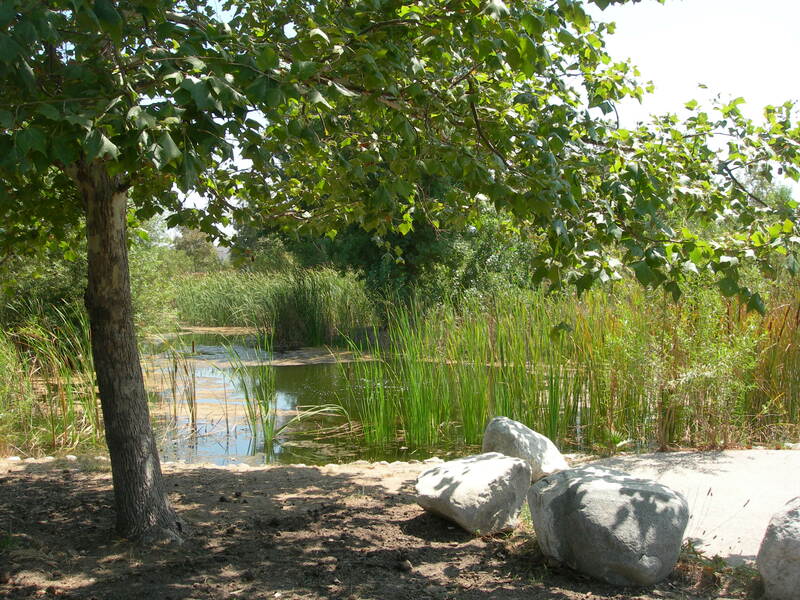 A few blocks west of the Blue Line's Slauson Station lies one of the best-kept secrets in South Los Angeles -- Augustus F. Hawkins Natural Park, an 8.5-acre surreal green oasis in the 'hood, featuring ponds, native plants, hiking trails, picnic areas and even wildlife. This former DWP pipe yard was converted into a re-created natural park, named after the late African American congressman who represented the area for 28 years, in 2000 by the Santa Monica Mountains Conservancy, which trucked in actual dirt from Malibu mudslides to the site to form the park's terrain. The park is popular with local residents seeking refuge from urban life, and the park is also popular with members of the local Audubon Society, who frequent the park to do bird sightings and bird counts. When passengers rode the Blue Line for the first time in July 1990, they were thrilled to have the train suddenly shoot up the elevated structure, with a towering view of the area below as the train stopped at the Slauson Station. While stopped here, you can see a piece of the Blue Line's Pacific Electric heritage by just looking to the east: The unmistakable curved "wye" tracks heading eastward formed another major junction to the PE's Long Beach Line trunk, as the place where trains bound for Fullerton, La Habra and Whittier diverged from the quadruple-tracked "Speedway." Francis Nixon, the father of President Richard Nixon, was once a Pacific Electric motorman who navigated his Whittier-bound trains through this very junction. 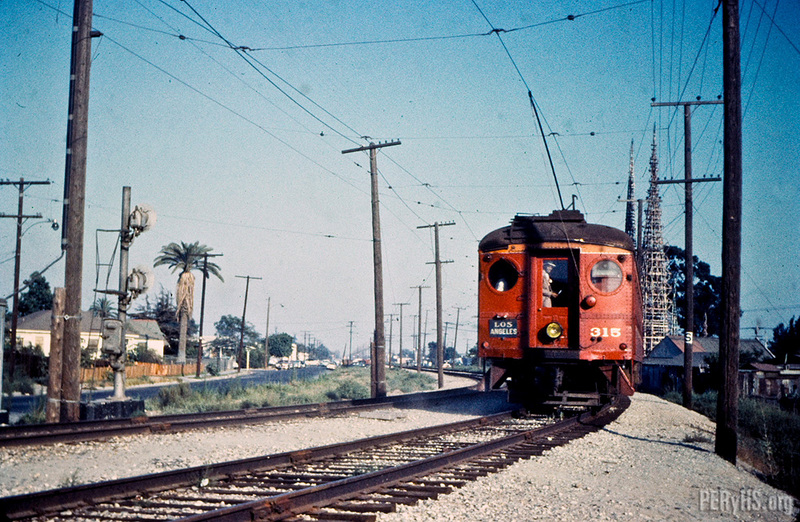 In the Pacific Electric era, this junction, where the overhead pedestrian bridge is located today, marked the end of the four-track "Speedway" which had express trains from 9th and Hooper streets in Downtown Los Angeles go to/from Watts in the center tracks, while the outer tracks handled local stops Dominguez Junction is where trains along the Long Beach trunk line headed west to Torrance, southwest to San Pedro and southeast to Santa Ana via Bellflower. Directly adjacent to the former Santa Ana tracks are the famed Watts Towers, built by Italian immigrant Simon Rodia (who actually called his sculpture "Nuestro Pueblo") between 1921 and 1954. 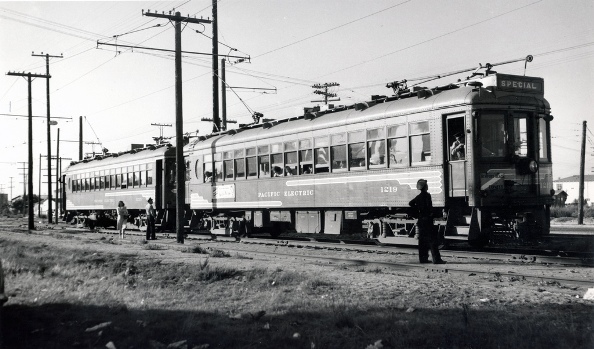 There is definitely a direct relationship to the Pacific Electric: Rodia used the rails on the PE Santa Ana tracks as a fulcrum to bend his steel bars into shape, enabling him to build his masterpiece. 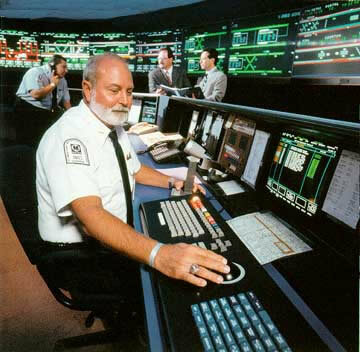 At the nexus of the Blue and Green Lines, just east of the Willowbrook Station is Metro's Rail Operations Center (ROC), where all of the 87-mile rail system's signaling, dispatching and security systems are manned and monitored. The building also houses a Los Angeles County Sheriff's Department station, as part of their Metro system security operations. Adjacent to the ROC is a non-revenue connector track that allows light rail vehicles to transfer between the Blue and Green lines for emergency or service purposes. The single track also allows light rail vehicles based out of the Metro Green Line yard in Torrance to move to the Long Beach yard, which houses a paint shop and heavier maintenance facilities. But in case you're wondering, the track is not equipped to handle revenue service from, say Long Beach to Redondo Beach. The Willowbrook Station is due for a major renovation in the near future. If you're a regular Blue Line commuter and need your fill of fresh, locally-grown produce, get off at the Compton Station on Thursdays from 3 to 7 p.m. and visit the weekly certified Blue Line Farmers' Market. Started in September 2013 to combat food desert concerns in the local community, the market has become a hit with locals and commuters alike. There are currently 24 weekly certified farmers' markets at or near Metro Rail stations, visit them regularly! The first waterway the Blue Line crosses isn't the Los Angeles River, but one of its tributaries, Compton Creek. 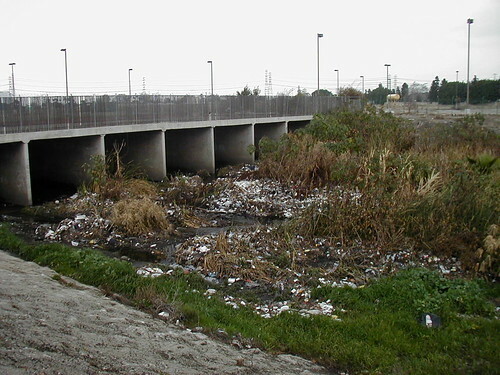 You can see the 8-mile stream before approaching the Artesia Station and immediately east of the Del Amo Station. Be on the look out for horses, as there's an equestrian trail alongside it. The equestrian and cowboy culture of Compton actually predates its street gang reputation by several decades, and in fact lives on today in the form of a youth equestrian program called the Compton Jr. Posse. Also located along Compton Creek, midway between the Artesia and Del Amo Stations east of the Blue Line tracks is the Rancho Dominguez Adobe Museum, highlighting the Spanish-era land grant roots and early California history of the Compton and Carson areas. Worth a bike ride from either of those stations! Midway between the Artesia and Del Amo Stations is what appears to be a highway, which is actually Alameda Street. adjacent to it are a set of railroad tracks -- both the street and the tracks form the Alameda Corridor, a ground transportation system opened in 2002 that allows trucks and trains to easily access the Ports of Los Angeles and Long Beach -- important gateways for importing and exporting for not just Southern California, but the entire United States. Toys from China and cellphones from Korea pass through the Alameda Corridor in the form of intermodal shipping containers en route to Chicago or other U.S. destinations. The corridor began construction in 1997 as a way to consolidate the Union Pacific and BNSF railroads onto a unified, high-capacity, mostly grade-separated track to and from the port area. 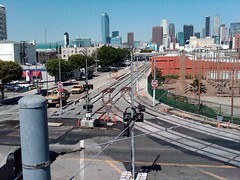 North of here, the tracks run in a trench alongside Alameda Street to railroad yards southeast of Downtown Los Angeles. 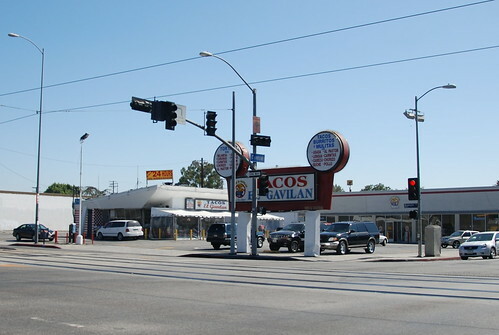 Sandwiched between the 710 Freeway and the Los Angeles River is the Metro Blue Line Yard and Shops, otherwise known as Metro Division 11. It is here where Blue and Expo Line cars make their home and are cleaned, painted and serviced. Cars from other light rail lines also visit this yard for work that can't be performed at their respective home yards. Blue Line trains also stop near the yard regularly on a mini-platform to allow operator crew shift changes. As soon as your Long Beach-bound Blue Line train crosses the Los Angeles river, look to the right side of your train and you'll see about four concrete abutments next to the tracks. Those were part of the Pacific Electric Long Beach Line infrastructure -- the abutments supported the old Long Beach Line bridge that crossed the Los Angeles River. Look to the left after your train leaves the Willow Station and you'll easily see the now-paved-over right-of-way that diverged from here that formed Pacific Electric's Newport-Balboa Line, which reached the PE's southernmost point in Balboa Island. The line today supports parks and bikeways, as well as this bridge in Long Beach that still exists today, which The Militant covered in 2011. 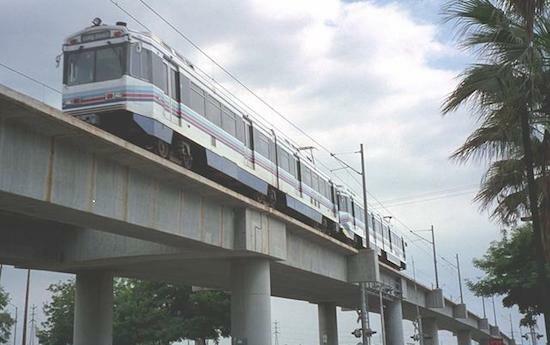 The first "extension" of the Metro Blue Line opened in September 1990 when the Long Beach Loop was completed, allowing Blue Line trains to run in a clockwise-loop around Downtown Long Beach before heading north to Los Angeles (Before September 1990, Long Beach Transit shuttle buses painted like Blue Line trains provided interim service on the Long Beach Loop). Early operation scenarios for the Blue Line planned for "Loop Only" trains (the original rolling head signs of Blue Line trains had such a designation) that ran continuously through the Long Beach Loop, but in reality they never had a need to happen. In 1996 the nation's first-ever Bikestation opened here in Downtown Long Beach, just yards away from what was then called the Transit Mall Station (now the Downtown Long Beach Station). It was a one-stop facility for bicycle commuters and recreational cyclists alike, as a place to park, maintain, rent or purchase bike accessories. In 2011, the operation moved into its current, very orange, expanded facility. The Bikestation was a pillar of Long Beach's bike community and bicycling infrastructure, which includes protected cycle track bike lanes, bike paths and several marked bike lanes across town. Here is the southern-end counterpart to the aforementioned Washington Tail Track. This track was also designed to temporarily store bad-order or malfunctioning trains, as well as supplemental trains to fill in service gaps made from out-of-commission trains. It is also rarely used. Commandeered by Militant Angeleno @ 6:22 AM 1 comment: Hyperlinks, yo!